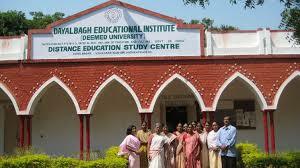 The Dayalbagh Educational Institute is having an objective of providing the benefits of the college innovative and also value based education to all remote and unreached backward areas for the empowerment of all economically weak people. To serve the students who are not able to afford the cost of education who are away from their homes. Are you Interested inDEI DEP Distance Education Visakhapatnam"? Please provide the following details.